Ann Fournier spends her hour-long commute piecing together tiny petals of red crepe paper to assemble poppies to support veterans. (BPT) – For many Americans, it starts with wearing the poppy on National Poppy Day, an annual tribute to the price of freedom. This year, National Poppy Day is May 25. The red poppy holds great meaning for veterans all over the world. After the battles of World War I, the blood-red poppy flourished in France and Belgium when battlefields became burial grounds. The red flowers suddenly bloomed among the newly dug gravesites of fallen service members, turning the new graveyards into fields of red. Today, the poppy is a symbol of sacrifices made from WWI to today’s war on terror. Members and volunteers connected to the ALA, one of the nation’s most prominent supporters of veterans’ rights, leverage the poppy in service to the veteran community through Poppy Day distributions and outreach. 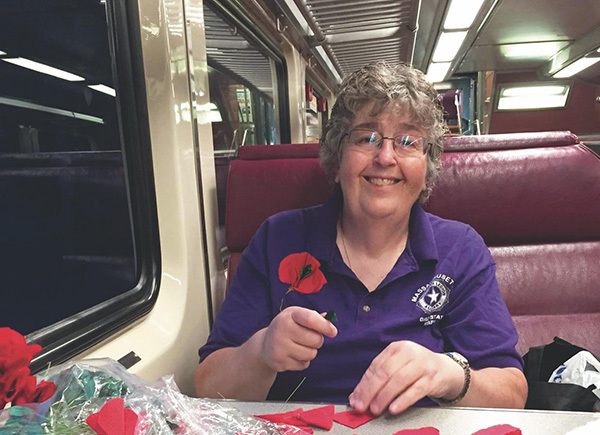 ALA volunteers hand out red paper or fabric poppies in exchange for donations that go directly to support veterans. 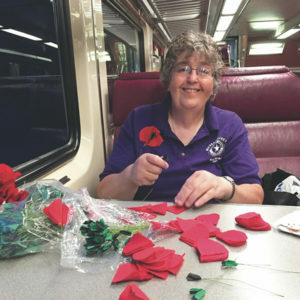 Many of those poppies are made by hospitalized and disabled veterans as a form of rehabilitation and a source of income through this ALA program. In 2017, ALA members throughout the U.S. distributed nearly 6 million poppies or poppy items and raised $3.9 million in donations that went directly to help veterans, military and their families.